Topic 65: How do teenagers and adults perceive facial expression differently and why? It is believed that teens respond differently to the world because of hormones, or attitude, or because they simply need independence. But a recent study and experiment on adults and adolescents brains using magnetic resonance imaging (MRI) you can see how their brains work differently. At the McLean Hospital in Belmont, Mass., Deborah Yurgelun-Todd and a group of researchers have studied how teenagers and adults perceive emotions. The group looked at 18 children between the ages of 10 and 18 and compared them to 16 adults using MRI. The researches could see what part of the brain each person used to figure out what emtion was on a face. Many teen subjects failed to interpret the emotion in faces like this one as fear. The results surprised the researchers. The adults correctly identified the expression as fear. Yet the teens answered “shocked, surprised, angry.” It turns out that adults use the frontal cortex, which governs reason and planning to figure out what the expression was while the teenagers used the amygdala, a small almond shaped region that guides instinctual or “gut” reactions. 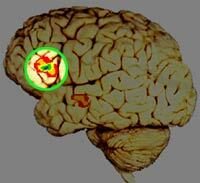 As the teens got older the center of activity moved away from the amygdala and to the frontal cortex. 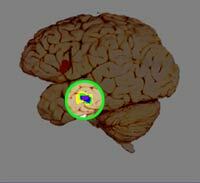 When reading emotion, teens (left) rely more on the amygdala, while adults(right) rely more on the frontal cortex.